Social indicators can play an important role not only at national but also international level, in making it possible to compare the living conditions in different countries according to a set of commonly agreed criteria. For them to play this role in a multinational context, their construction needs to follow methodological principles that ensure their relevance and comparability across countries. 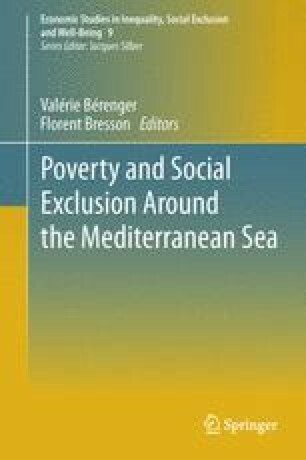 This chapter argues that the Euro-Mediterranean countries can benefit from the European Union (EU) experience in building a common framework for monitoring, understanding and also fighting poverty and social exclusion. As a concrete example, it discusses methodological issues raised by the construction of indicators on material deprivation, defined as an enforced lack of a combination of items depicting some aspects of living conditions related to housing conditions, possession of durables and capacity to afford basic requirements. More specifically, this chapter focuses on the selection of items, their dimensional structure, their aggregation in a synthetic measure and their weighting. It also puts in perspective material deprivation and income-based poverty indicators to emphasise the complementarity of the two approaches when applied to a group of countries with heterogeneous standards of living. It covers 24 EU countries. We would like to thank Vincent Dautel, Daniel Defays, Joseph Deutsch, two anonymous referees, the editors and the participants to the workshop on “multidimensional poverty and pro-poor growth in the MENA countries” (CEMAFI—University of Nice Sophia Antipolis, 11–12 June 2009) for helpful comments. These persons should not, however, be held responsible in any way for the present contents. Goodness of fit index (GFI) represents the amount of variances and covariances in the sample covariance matrix that are predicted by the model. Theoretically, its maximal value is 1. However, as GFI is affected by the sample size and the number of indicators, its upper bound can be lower than one, even in the case of perfect fit. A standard rule of thumb is that the GFI for good fitting model should be greater than 0.9. Adjusted goodness of fit index (AGFI) is the GFI adjusted for degrees of freedom. A value superior to 0.8 is more often used as a cutoff value to consider that the model is well fitted. Root mean square residual (RMSR) is the square root of the average of the square of the residuals between the sample and modelled covariance matrix. The lower the fit between the model and the data, the larger the RMSR. Parsimonious goodness of fit index (PGFI) is a variant of the GFI that takes the parsimony of the model into account.